Building period custom cars and traditional hot rods takes moxie, grit, and gumption. But more than any of that, it requires deep respect. Respect for a bygone era of great American car design. The Harry Bradleys, Virgil Exners, and Harley Earls, whose styling studios made American cars the belles of the ball back in the day. It takes reverence. Reverence for a generation of car customizers who turned factory masterpieces into an entirely new rolling artform. Custom cars. Panel and fade-painted masterpieces with subtle chops, radical sections and pinstriping courtesy of visionaries like Gene Winfield, Larry Watson, Joe Bailon, and Von Dutch. Custom cars that toured the country capturing the imaginations of America’s youth like fireflies in a mason jar. The Alexander Brothers’ Dodge-sponsored “Diora”. Darryl Starbird’s futuristic “Predicta”. Ed Roth’s wild “Beatnik Bandit”. Fiberglass flights of fancy and meticulously sculpted sheet metal by visionaries like Bill Hines, Sam and George Barris, and Dean Jeffries. Fins were extended, hoods pancaked, and lights recessed. Bubble-topped dream cars packed auditoriums and made Darryl Starbird, Bill Cushenberry and Ed “Big Daddy” Roth household names, to say nothing of their creations which were immortalized in scale replicas by Monogram, Revell, and AMT. Another fascination soon emerged as America’s youth reached driving age. Organized car club racing, which gave rise to its nitro-burning sugar daddy, drag racing. Smokey burnouts, grenading clutches and blower explosions became a national pastime. Thanks to Wally Parks and the NHRA, elapsed speed records sometimes lasted mere minutes, and we had TV Tommy Ivo, Don Garlits, Tom “The Mongoose” McEwen and Don “The Snake” Prudhomme to thank for thank for that. And let’s not forget Jungle Jim and his halter-topped cohort, Jungle Pam, who stole America’s hearts diligently lining Liberman up in the staging lanes at events. Shirley “Cha Cha” Muldowney, the “first lady of drag racing”, and the lovely Linda Vaughn of “Miss Hurst” fame further fed America’s infatuation. These were the folks that ignited the young and impressionable mind of a man raised on nitro, free love and little books. A man known today as Mercury Charlie. THERE’S MORE THAN ONE AUSTIN SPEED SHOP IN AUSTIN. 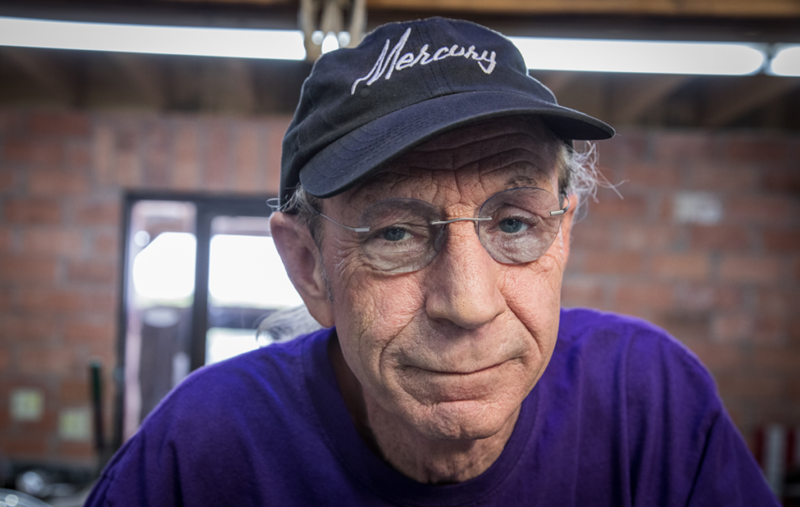 Today, Mercury Charlie helms an Austin speed shop with his own name on the door – Mercury Charlie’s. A shop whose period builds not only predated Austin Speed Shop but literally put them on the map. Yes, Mercury Charlie was an original partner in South Austin Speed Shop, now known worldwide as Austin Speed Shop thanks to The Discovery Channel and none other than Jesse James, for whom Charlie painstakingly built a killer ‘51 Mercury. That car was featured in the hallowed pages of Rod & Custom magazine. The rest is hot rodding history. WHY HIRE A MONKEY TO DO A MECHANIC’S JOB? Enough about Austin Speed Shops, custom car history, and reality TV. Let’s talk about Mercury Charlie’s garage, a shop built as methodically as his legendary customs. Surrounded by like-minded vintage car lovers, Charlie’s crew is skilled in all aspects of customization and old-school hot rodding. Fabricators. Stitchers. Mechanical savants. Horsepower wranglers. Kindred spirits who burn the same oil that Charlie does, operating under the influence of a man who has been a custom-car icon since long before reality TV muscled its way onto the Central Texas car scene. You might say we’re the real deal, as not seen on cable. Welcome to Mercury Charlie’s, where we’re more interested in building dream cars than television audiences. We’re a full-service shop where old school rules and the custom is always right. Where vintage cars are revived, rehabilitated and returned to their former glory for owners whose names you may or may not recognize. But whose cars you’ll never forget. We put the cool back in ol’ skool.